Do you remember books? They were those paper things with a heavier cover that some of you may have lugged around during your early school years. Well. guess what? As genealogists much of what is useful and necessary in researching our ancestors is still stored in those paper pages. All you with bibliophobia can take comfort in the fact that many of these books are available in ebook editions or are already online. The following list contains those books I consider essential to an understanding of genealogy. Some of them seem to be overly topical or specific, but they are essential none-the-less. You may disagree because of your own particular interests or ancestry, but by and large, reading and/or studying any of these books will assist you in pursuing your goal to discover your ancestry. You are certainly welcome to add your own suggestions in the comments to this post. Another point is that there may be an existing surname book or local history that would be extremely valuable to you and may be of no interest to me. I have done a list like this some time ago, but I decided to compile the present list without reference to the previous one (or ones) just to do one from my present perspective. This list is in alphabetical order by citation. I think that some of these books are more useful than others, but rather than give a "review" of each book, it will suffice to have a list. By the way, as search on WorldCat.org for the word "genealogy" comes up with over 1.2 million items, most of which are books. Ancestry.com (Firm), and D.C.) Board for Certification of Genealogists (Washington. Genealogy Standards, 2014. Anderson, Robert Charles. Elements of Genealogical Analysis, 2014. Anderson, Robert Charles, and New England Historic Genealogical Society. The Great Migration Begins: Immigrants to New England, 1620-1633. Boston: New England Historic Genealogical Society, 1995. Anderson, Robert Charles, George Freeman Sanborn, Melinde Lutz Sanborn, New England Historic Genealogical Society, and Great Migration Study Project (New England Historic Genealogical Society). The Great Migration: Immigrants to New England, 1634-1635. Boston: New England Historic Genealogical Society, 1999. Baxter, Angus. In Search of Your British & Irish Roots: A Complete Guide to Tracing Your English, Welsh, Scottish, & Irish Ancestors. New York: Morrow, 1982. Black, Henry Campbell, 1860-1927. Black’s law dictionary. St. Paul, Minn.: West Group, 2009. Clemensson, Per, and Kjell Andersson. Your Swedish Roots: A Step by Step Handbook. Provo, UT: Ancestry, 2004. Durie, Bruce. Scottish Genealogy. Stroud: History, 2012. 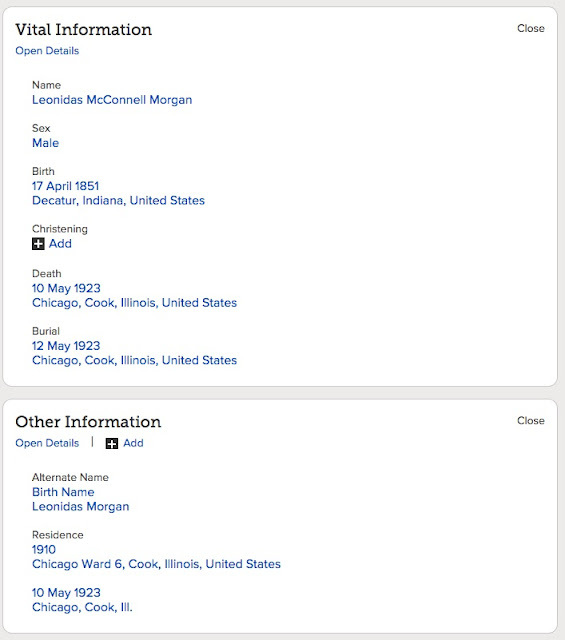 Eichholz, Alice, and Ancestry Publishing. Redbook: American State, County & Town Sources. Provo, Utah: Ancestry, 2004. Evans, Barbara Jean, and Barbara Jean Evans. The New A to Zax: A Comprehensive Genealogical Dictionary for Genealogists and Historians. [Champaign, IL]: B.J. Evans, 1990. Everton, George B. The Handybook for Genealogists: United States of America. Draper, Utah: Everton Publishers, 2002. Fischer, David Hackett. Albion’s Seed: Four British Folkways in America. New York: Oxford University Press, 1989. Greenwood, Val D. The Researcher’s Guide to American Genealogy. Baltimore, Md. : Genealogical Pub. Co., 1990. Herber, Mark D, and Society of Genealogists (Great Britain). Ancestral Trails: The Complete Guide to British Genealogy and Family History. Stroud, Gloucestershire [England]: History Press, 2008. Humphery-Smith, Cecil R. The Phillimore Atlas and Index of Parish Registers. Andover, Hampshire: Phillimore, 2010. Jacobus, Donald Lines. Genealogy as Pastime and Profession. Baltimore: Genealogical Pub. Co., 1968. Kinealy, Christine. Tracing Your Irish Roots. Belfast: Appletree Press, 1999. Maxwell, Ian. How to Trace Your Irish Ancestors an Essential Guide to Researching and Documenting the Family Histories of Ireland’s People. Oxford: How To Books, 2008. http://search.ebscohost.com/login.aspx?direct=true&scope=site&db=nlebk&db=nlabk&AN=244183. Meyerink, Kory L, Tristan Tolman, and Linda K Gulbrandsen. Becoming an Excellent Genealogist: Essays on Professional Research Skills. [Salt Lake City, Utah]: ICAPGen, 2012. Mills, Elizabeth Shown. Evidence Explained: Citing History Sources from Artifacts to Cyberspace. Baltimore, Md. : Genealogical Pub. Co., 2012. ———. Professional Genealogy: A Manual for Researchers, Writers, Editors, Lecturers, and Librarians. Baltimore: Genealogical Pub. Co., 2001. Minert, Roger P. Deciphering Handwriting in German Documents: Analyzing German, Latin, and French in Vital Records Written in Germany. Woods Cross, Utah: GRT Publications, 2001. Ryskamp, George R. Finding Your Hispanic Roots. Baltimore: Genealogical Pub. Co., 1997. ———. Tracing Your Hispanic Heritage. Riverside, Calif.: Hispanic Family History Research, 1984. Ryskamp, George R, and Peggy Ryskamp. Finding Your Mexican Ancestors: A Beginner’s Guide. Provo, Utah: Ancestry Pub., 2007. Sperry, Kip. Reading Early American Handwriting. Baltimore, Md. : Genealogical Pub. Co., 1998. Szucs, Loretto Dennis, and Sandra Hargreaves Luebking. The Source: A Guidebook of American Genealogy. Salt Lake City: Ancestry, 1997. The Chicago Manual of Style. Chicago: The University of Chicago Press, 2013. Weil, François. Family Trees: A History of Genealogy in America, 2013. Yesterday, I took the time to figure out how to check books out of the Brigham Young University, Harold B. Lee Library. I then went down to the first level, which is two stories underground and one level down from the underground Family History Library and walked the stacks. This activity immediately took me back in time to my earliest memories of searching the stacks in the Phoenix Public Library when I was about eight or nine years old. Reading books online is certainly more convenient and works better into my frantic life style, but there is something immensely important about seeing all those books carefully lined up and cataloged on the shelves. I can hardly convey the feeling of walking into that immense array of shelves. It is summer at the university and my trip to the stacks was solitary. There were only one or two students studying at tables as I ventured into the human wilderness of books. After finding the specific book I was looking for, I returned to my old habit of reading the shelves. I quickly located the genealogy related books and found a significant storehouse of books on this subject. Nothing much compared to the Family History Library in Salt Lake City, but a significant collection none the less. When combined with the Family History Library upstairs and the Social Sciences Library where I was browsing, there is a useful and impressive collection of books. but I realized that I had gained access to a goldmine of information in the BYU Library and that it would be nice to share some of that information with my readers (those I haven't driven away already by my opinions and commentary). My benefit will be to return to my habit of reading two or more books a week. I have been known to read more than a dozen, but that was long before my life became complicated and I began spending so much time writing. Part of my motivation for beginning a book review feature is that I am acutely aware of how few genealogists or would-be researchers are acquainted with the benefits of reading genealogy books. My observations in both the Mesa FamilySearch Library and here at BYU is that visitors to the Libraries rarely, if ever, look at the books. I was asked a question the other evening and I took the person asking the question over to the shelves nearby and pulled out the book that they needed to answer the question. From what I could tell, the person was dumbfounded and didn't really know what to do with this strange answer to her question. I am sure she was asking, "Does this person really think I will read an entire book just to answer a simple question?" Well, actually the answer her reaction is "Yes, I do expect myself and others to read books and answer their own questions." Rogers, Colin, and Colin Rogers. Tracing Your English Ancestors: A Manual for Analysing and Solving Genealogical Problems, 1538 to the Present. Manchester, UK; New York; New York, NY, USA: Manchester University Press ; Distributed in the USA and Canada by St. Martins’s Press, 1989. In this day of instant technology, it is good idea to remember that genealogists are interested in history and even an older book can have an immense value to our research efforts. This pre-computer-technology book will be my first official review in this ongoing series. Meyerink, Kory L., Tristan Tolman, and Linda K. Gulbrandsen. Becoming an Excellent Genealogist: Essays on Professional Research Skills. [Salt Lake City, Utah]: ICAPGen, 2012. I am now commenting on Chapter 18: "Documentation and Source Citation" by Amy Harris, PhD., AG. In many ways, it is not whether one receives payment or not that sets apart the amateur from the professional genealogical scholar but rather the standard of documentation that one adheres to in one's work. I am not sure that the dichotomy between "amateur" and "professional" holds up in the context of historical (i.e. genealogical) research and reporting. Failing to cite sources does not make one an "amateur." Also, the term "amateur" does not automatically imply poor or sloppy work. There is a much deeper issue here and that is the need to analyze and properly incorporate sources as well as cite them. As I have pointed out many times previously there is a tendency in certain levels of genealogical inquiry to exalt form over substance. No matter what your position with regard to the need for formality in citations, there is a absolute need to identify your sources with enough particularity that subsequent researchers can duplicate your searches and verify your conclusions. This particular chapter has some rather lengthy and numerous footnotes. I might note that very few of the other articles in the book have comparably long and involved notation. Perhaps the author was making a point in including long and overly explanatory footnotes? It is my own style to include all references within the text of my posts (if you haven't noticed). I try to consistently make reference to any source that I utilize, no matter how obscure. Of course, I have no expectation that anything I write in this fashion will be published in a prestigious journal, but I think that footnotes interrupt the flow of the text in some cases and including the sources with the quote or idea is less intrusive. The author does not discuss other ways of inserting citations. Many currently popular journals require citations to be inserted into the text. Footnotes, as such, are also liable to be put at the end of chapters or the entire document, i.e. endnotes. I think that the way the document incorporates notes and the content of those notes, quickly influence whether or not a reader is willing to plough through the document at all. I am also not particularly a fan of writing the paper in the footnotes. Reading such a paper is like listening to more than one conversation at the same time. To repeat, I certainly agree that citing sources is necessary. I am currently faced with more than one surname book containing information that cannot be verified due to the lack of citations. I would be grateful for any attempt at telling me where the authors got their information, irrespective of the formality or lack thereof. All things, both good and bad, come to an end sometime and this series is no exception. I guess, what it boils down to is that genealogical research is a rather complex activity and encompasses a huge spectrum of individual interests and goals. On the one hand, there are those who are satisfied in copying a few names into an online family tree. At the other end of the spectrum, there are professional genealogists who adhere to a complex system of proof statements and citations with the aim to publish their conclusions in journals and other publications. Some of those at the professional level also provide genealogical research services to clients for pay. Due to this dichotomy within the genealogical community, we find several areas of tension, with substantial pulls from all the views of how genealogical research should be done. The overriding issue is accuracy and consistency. No matter how the process is characterized, it is essential that the conclusions reflect the broadest possible selection of historical documents and records. It is also extremely important that each and every record or document consulted by recorded so that the researcher and any subsequent researchers, can reproduce, if necessary, the method by which the conclusions were derived. The main activity of genealogists (family historians or whatever) involves identifying, locating and searching historical records of all kinds for information about their (or their clients') ancestry. Once those documents are searched, any pertinent information is recorded with a citation to its exact location. As the researchers assembles the information, he or she begins the process of evaluation and interpretation. In some cases, it may be helpful to future investigators for the researcher to record their thought processes, but always recognizing that the discovery of additional documents or records or a re-interpretation of the existing records can completely change or modify any previously made conclusions. All genealogical conclusions are always open to modification and abandonment. Complex issues of copyright law and plagiarism have influenced genealogical research for decades. For a variety of reasons, researchers have come to believe that they own their historical discoveries and conclusions. This attitude manifests itself in a variety of ways from the publication of research findings with claims of copyright protection to the hoarding of information with a refusal to share that information even with close family members. Whether this protective attitude originates with the hoarding compulsion or from an expectation that the researcher will be compensated by recognition or monetary gain, the results of these claims acts as smothering blanket on the entire research process. As a result, each generation of researchers has been forced to redo much of the work done by previous researchers. This is especially true when the previous research efforts were lacking in source citations. Any genealogical conclusions that lack adequate documentation of both the source of the information and the thought process of the researcher, will always require duplication of effort. Genealogical research is essentially a process that includes both methodology and theory. The methodology can vary and the theory has been sadly neglected over the years. As with most aspects of our modern society, technology has had a significant impact on the entire genealogical research process. The availability of online, digitized copies of a substantial number of historical records and documents will continue to change the way research is conducted, i.e. the methodology, but will have little impact on the theory. The difficulty is that the theory of how and why genealogical research is conducted is far from fully developed. It is very difficult to talk about genealogy or family history, as such, without encountering such a wide response to make communication almost impossible. Part of this difficulty has come from the incorporation of inappropriate terminology, borrowed from other activities, that impedes the process of understanding and applying effective research activities. This spectrum of terminology and jargon was recently epitomized by the recent trends to make genealogy "entertaining." This particular trend obscures or completely abandons the core activities and motivation and the need to adequately research and identify ancestors. 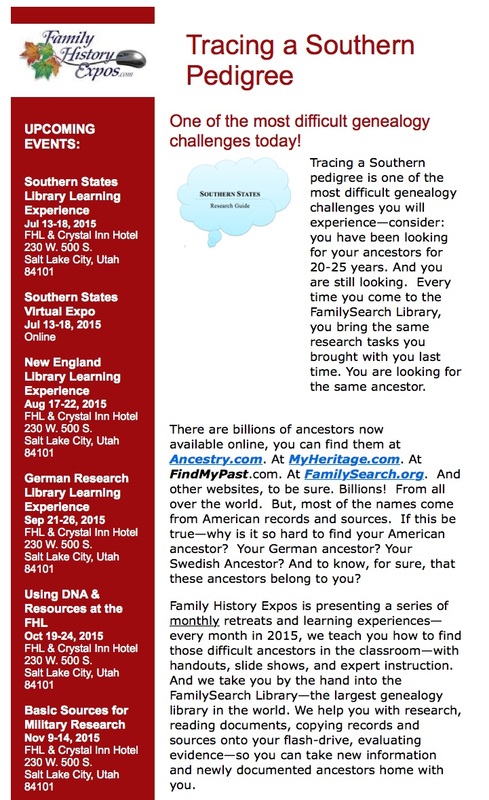 This is being advocated at the expense of attracting people to "family history" at a casual and unstructured level. 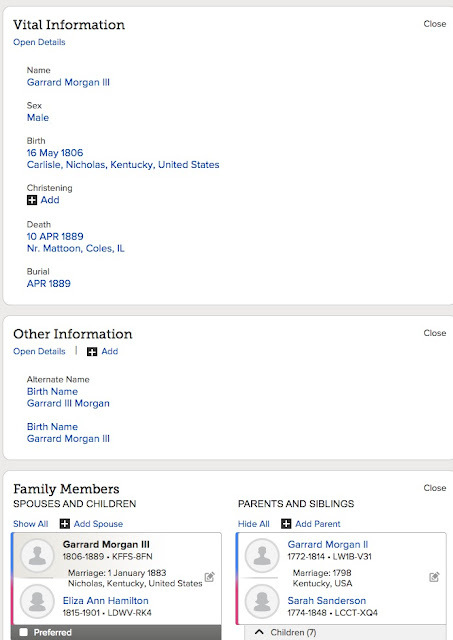 The family tradition and the extended line for the Morgan family I discussed in the last installment, would lead you to believe that my Morgan ancestors were related to Daniel Boone's mother, Sarah Morgan Boone. As I have already shown, this is highly unlikely since the there are inconsistencies and inaccuracies in the data many generations and many states away from the Boone family. The examination of the recorded, individual events in the last blog post illustrates the basic concept of research; that is, the direct relationship between searching historical records for information concerning individual ancestors and their families and the accuracy of the information recorded. This post and the one following will summarize and conclude this rather lengthy series, but these posts will by no means conclude all that I have to say on the subject of research. Genealogy is entirely a research oriented activity and it is tragic how few of the adherents spend the time and energy necessary to adequately explore and document their ancestry. The issues I pointed out in the previous post may seem trivial, but they illustrate real issues of accuracy and consistency that question the entire structure of conclusions made about this particular family by genealogists stretching back over 150 years. In that relatively short time, the accuracy of the information about Garrard Morgan is called into question. By the way, as far as I can determine, the addition of the middle name "Hamilton" to my Great-grandfather, John Morgan, was done by the genealogists after his death, he did not use that name during his lifetime. 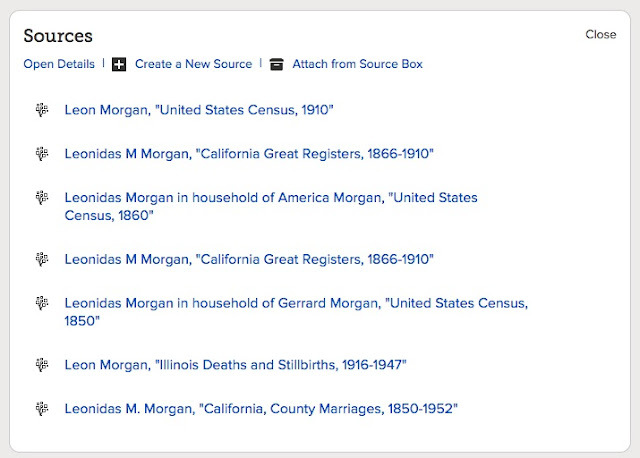 Likewise, the designation "III" of Garrard Morgan is also a genealogical addition. The goal of genealogical research is demonstrating valid conclusions supported by the examination of historical records and documents. The individual researcher must come to his or her own conclusions. The source of the information that influenced the formation of those conclusions must be recorded or the conclusions must be considered tentative and unreliable. Notwithstanding the need to derive valid conclusions, to some degree, all genealogical conclusions are basically incomplete and tentative because the discovery of additional historical records or documents may change those conclusions at any time. Each step or generation backward into the past must be supported by some validly derived conclusion (no matter how it is designated) in order to justify adding another generation. If the motivation of the researcher is other than deriving supported conclusions (i.e. trying to connect to royalty or whatever) then every conclusion is suspect. Two major distractions in the present genealogical research community consist of ignoring the tentative nature of all historical research and constantly focusing on the formal presentation of the conclusions. I certainly agree with the need to carefully document each conclusion. It also helps, in some limited cases, to explain your conclusions, but, as I have previously stated, using the Chicago Manual of Style does not necessarily validate your conclusions. The information about Garrard Morgan, III is very limited in the John Morgan book. To me, the recorded research is very superficial, especially for a person who lived his entire life in the 19th Century. Of course, there may be many researchers out there that have extensive information about this individual, but how do I go about finding them? 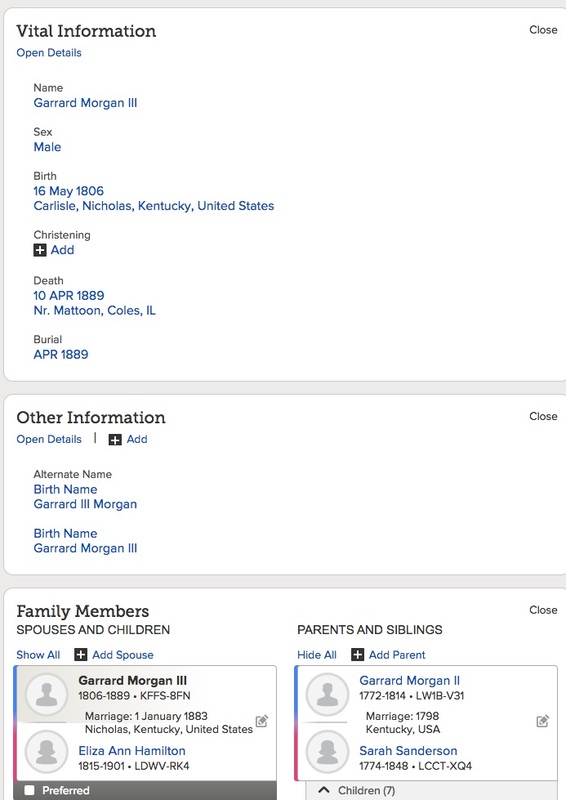 The whole point of the FamilySearch.org Family Tree is to create a unified family tree, one place where all of the information known about individuals and their families can be gathered and compared. If there are knowledgeable researchers with additional information who are failing to consider putting their information in the Family Tree, for whatever reason, they are impeding the research process and not helping to correct published information. As you can guess at this point, this whole process is ongoing and endless. The compilers and writers of the John Morgan book incorrectly assumed that everything was "settled" and presented his descendants with a beautiful, hard-bound book full of wonderful stories. Unfortunately, they failed to adequately document his ancestry. 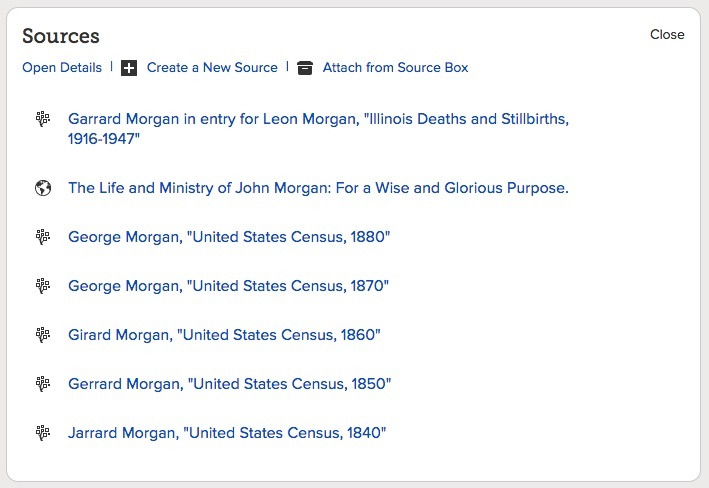 It is interesting to point out that John Morgan is listed in the 1850 U.S. Federal Census as "John W." In examining the sources recorded for Leonidas, I find even more discrepancies and inconsistencies. This is certainly a fertile field for accurate research. Other than illustrating the sorry state of the research on this particular family, what is the point? The answer to this question is contained in the 23 previous posts I have written on this subject. Stay tuned for further conclusions. The Elements of Research -- Part Twenty-three: Am I related to Daniel Boone? One of my family's persistent traditions is an alleged relationship to the famous American, Daniel Boone. Year's ago, I disproved that tradition with some brief research in the Family History Library in Salt Lake City, Utah. Now the tradition has emerged again in the form of entries in the FamilySearch.org Family Tree. Since I have been writing this seemingly endless series on research, I have become more focused on my "Morgan line" of research. I have decided that it is time to use this family to illustrate some of the basic concepts I am trying to convey with this series. Is the name of the ancestor accurately recorded with a supporting source? Are the dates and places accurately recorded and supported by sources? Did the towns, cities, counties or even countries exist at the time of the event? Do the dates and places need to be standardized? Are the dates recorded consistent with reality? Where was each child born? Do the birth dates of each child make sense and are they realistic? Richardson, Arthur M, and Nicholas G Morgan. The Life and Ministry of John Morgan: For a Wise and Glorious Purpose. [Place of publication not identified]: N.G. Morgan, 1965. Unfortunately, the book provides few sources and none for the information concerning Garrard Morgan III. 2. Both the place and the date need to be verified. You must take the time to verify each individual, particularly before moving on to the next generation. The fact that this information "came from a book" carries no weight at all. 3. If there is a burial date, there should also be a burial place. 4. This "extra" Birth Name is extraneous. 5. Same problem with extra, extraneous information. 6. The marriage date is obviously wrong since it is many years after the birth of the children and when the mother was 68 years old. These are just a few of the initial problems and questions those problems create. With all these issues, there is no way that any information concerning subsequent generations is believable at this point. Even it this record has sources, it is apparent that the sources are not sufficient to establish the the dates and places in the information provided so far. I will continue the analysis of this entry in my next post and discuss how to determine what kinds of records would assist in correcting and expanding the information about this person. At this point the question in the title to this post about a relationship to Daniel Boone cannot be answered. Obviously, the basic information in the file would not allow such a conclusion to be reached. Family History Expos is presenting a series of monthly retreats and learning experiences—every month in 2015, we teach you how to find those difficult ancestors in the classroom—with handouts, slide shows, and expert instruction. And we take you by the hand into the FamilySearch Library—the largest genealogy library in the world. We help you with research, reading documents, copying records and sources onto your flash-drive, evaluating evidence—so you can take new information and newly documented ancestors home with you. Oh, let’s be clear about this—you do the work under our careful eye and with our expert help. You will wow your genealogy cousins with the problems you solve, along with your greater understanding of research and how to find and document ancestors that belong to you. For those of you who just can't make it to Salt Lake City in July, please join us virtually from your personal computer. You can participate with us live, ask questions, and enjoy the handouts. Much like attending a Family History Expo except you get more classes spread over 5 days. With time to relax in-between class sessions. The Elements of Research -- Part Twenty-two: Who needs codification? Codification is the the act, process, or result of arranging in a systematic form or code. In genealogy, this can take various forms. Genealogists use a variety of computer programs as well as informal (paper and pencils) and more formal methods to record (codify) the results of their research. Within the overall genealogical community, there are factions that advocate their own form of codification and actively promote their way of recording genealogical information as the "only" way it can properly be recorded. In addition, there is also a substantial majority of the genealogical adherents that choose codification by default. They allow whatever structure they encounter to dictate how they record their data. The two extremes in the genealogical community can be characterized, at one extreme, as name grabbers who simply populate an online family tree and think they are doing genealogical research and at the other end of the extreme, those who are convinced that only those who adhere to their particular view of codification are truly genealogists and the rest are beneath notice. Most of us fall somewhere in between these two extremes. Ragucci, Rodolfo M. El habla de mi tierra: lecciones prácticas de lengua española ... Buenos Aires: Editorial Don Bosco, 1963. This rather sizable book proscribed which types of phrases were "acceptable" Argentine Spanish and which were unacceptable. Your use or not of the word "ain't" is a perfect example of a regular contraction used by the English language that has become unacceptable due to social grammarians efforts to eradicate the usage of the word. Your use of language has become a classic class-marker as illustrated by George Bernard Shaw's Play, Pygmalion. Here is a Wikipedia comment on "ain't." The usage of ain't is a perennial subject of controversy in English. Ain't is commonly used by many speakers in oral or informal settings, especially in certain regions and dialects. Its usage is often highly stigmatized, and it may be used as a marker of socio-economic or regional status or education level. Its use is generally considered non-standard by dictionaries and style guides except when used for rhetorical effect, and it is rarely found in formal written works. We have exactly the same type of social stratification in genealogy only rather than focusing on the way we talk, the stratification is based on our personal method of recording our research, that is, our methods of codification. If you put all your family history on a publicly available family tree with no sources, you are definitely in a different category than if you publish your research findings in an accepted and revered genealogical journal. The difference is essentially in the level of codification you choose to learn and employ. The stratification comes from attaching value judgments to these two activities. On the one hand, those who fail to add sources or citations to their work are considered plebeians, while the "upper crust" uses the proper and highly structured formalities associated with their class status. In fact, many genealogist expend a huge amount of effort simply learning what is and what is not acceptable by the patricians. Do you worry about how you are recording your research? Think about it. For more than forty years I operated within a highly codified structure known as the U.S. legal system. Many years ago, I began the move sideways into an equally codified structure, genealogical research. In essence, I trade one structure for another. Personally, I think it was a good trade-off. But as with nearly all human activities, we have a tendency to codify our social rules and mores and separate into classes and I had to learn and adapt to the new paradigm of codification in my avocation of genealogy. Why has how we record our research become the chief indicator of class division among genealogists? My opinion is that there is very little else we can use to distinguish what I do from what you do and we have fastened our attention on one very obvious indicator. I could use a few other examples, but they would only make me even less popular than I probably already am in some circles. But there is a basic issue that transcends class distinctions. That is the need to accurately record our research efforts. Whether or not I use a "standard" citation method is vastly overshadowed by the need to record where I obtained the information I record. For example, this past week, I have been using a family from the FamilySearch.org Family Tree in my classes at the Brigham Young University Family History Library. The Family Tree records the family as General James Edward Morgan and his wife, Margaret Elizabeth Jarman. During the time I have been teaching this series of classes, someone has made some significant changes to this particular family line without recording any sources. In fact, I used this same family for examples in my blog posts recently. In one case, the person making the changes, changed a birth date for the wife that was listed as being more than a 150 years after the death of her husband. The husband was listed as being born in the 1600s and the wife in the 1800s, an obvious error. That particular couple also has 17 listed children. The husband is listed as having three different wives with 25 children listed for the second wife and 2 for the third "unknown" wife. The sources listed include three published genealogies from the 1800s and early 1900s. However, no source was listed for "correcting" the wife's birthdate. The husband was supposedly born in 1670 and married in 1679, no wonder he had so many children. It is abundantly clear that this family is a mess from a genealogical standpoint. What is even more interesting about this entry is that the three "sources" obviously do not refer to the named individual in the entry. The person named is identified as "General James Edward Morgan, (b. 1670, Bala, Merionethshire, Wales, d. 20 April 1736, Gwynedd, Montgomery, Pennsylvania, United States). The person changing the wife's birth date without citing a source, has apparently ignored the fact that the rest of the entries are ridiculous. What is interesting is that the probable Edward Morgan was not a General and is claimed to be the grandfather of Daniel Boone. 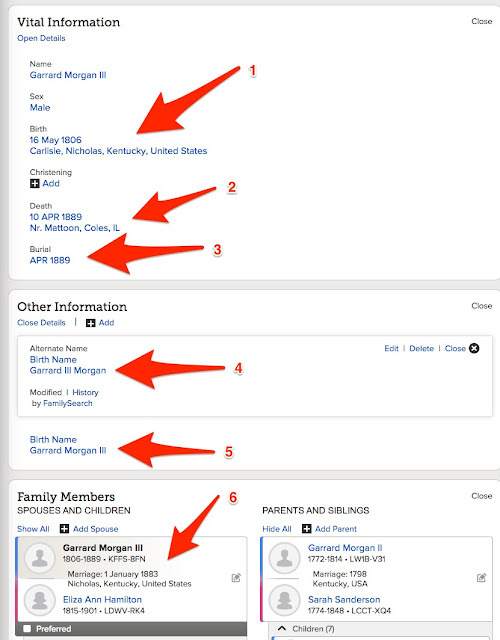 Although this family appears in my line on the Family Tree, I have long ago disproved any connection with this family and my own. As I pointed out, the three "sources" do not refer to the same three families and none of the sources refer to the family recorded in the Family Tree. Am I going to worry about the formalities of my citations when there are much more serious issues? As a matter of note, I am not going to untangle this family because my line actually ends three or four generations before I get to these illustrated problems. This series will keep going. Those blogs from commercial enterprises, societies etc., i.e. Ancestry.com etc. My first comment is that my categories didn't work very well. I have some categories with no blog posts. Of course, with what I have been counting lately, I really do not have any numbers that indicate a trend, but the distribution of the blog posts is very interesting and, at least today, the numbers support my non-scientific, very opinionated observations. The numbers adds up to 145, so I probably missed counting two posts. The largest category of postings was 46 posts from commercial bloggers who are promoting their businesses. This number was followed very closely by 43 posts from individual bloggers who also have a business agenda, such as selling books or other items. A sizable number were from the non-genealogy related blogs, with 30 posts. I only have a very small handful of non-genealogy blogs represented by this number, so the number is very large compared to the number of blogs in this category. There were 15 posts from regular, established bloggers who are not particularly commercially oriented and only 10 from newer bloggers that I do not recognize as posting regularly. Today, there was only one post from my family. Now, think about this. Even though this is a random sample from only one day's worth of blog post accumulations, the numbers exactly support my observations. Genealogy blog postings have gone very decidedly commercial and the total numbers postings are dropping like a rock. 89 out of the 145 posts were blog posts from commercially promoted blogs. Only 25 posts came from less commercially motivated genealogy sources. Even though I subscribe to only a handful of non-genealogy related blogs, they represented 30 of the 145 posts counted. The one post from my family is definitely in keeping with my own observations, since I have about 14 Instagram posts from my family in the last couple of days. I also have a solid stream of posts from my family on Facebook. After discussing this with my very astute and technology oriented family members, we all agree that there is a marked move from blogs to more immediate social networking. One daughter observed that the availability of Netflix.com movies probably cut into the blogging time also. This one-day count supports my observations that the online genealogy community has become very heavily commercialized. Overall, the number of blog posts is declining and a significant number of readers are moving to other online outlets such as Facebook. Did your ancestors have insurance? I suggest that most genealogists have never considered the question in the title to this post. But if you think about the question for even a few minutes, you will realize that insurance papers and applications are potentially valuable genealogical data sources. Insurance policies and applications fall into the category of business records, that is, those records kept by commercial enterprises. Today, insurance generally falls into four major categories; business, life, property and health insurance. To understand the importance of insurance and to begin the process of researching insurance documents, I need to review a little history. The first life insurance policies were taken out in the early 18th century. The first company to offer life insurance was the Amicable Society for a Perpetual Assurance Office, founded in London in 1706 by William Talbot and Sir Thomas Allen. The first plan of life insurance was that each member paid a fixed annual payment per share on from one to three shares with consideration to age of the members being twelve to fifty-five. At the end of the year a portion of the "amicable contribution" was divided among the wives and children of deceased members and it was in proportion to the amount of shares the heirs owned. Amicable Society started with 2000 members. The Mutual Assurance Society of Virginia was incorporated December 22, 1794. The organizational meeting was held in December of 1795 and policies began to be written in March 1796. The complete collection of policies of the Society from 1796 to 1867 (31,138 policies) are now in the possession of the Library of Virginia. These policies are available to researchers on twenty-three reels of microfilm, Accession number 30177. The Virginia Historic Landmarks Commission created a paper index for these policies. In 1993, the Center for Historic Preservation at The University of Mary Washington, completed computerizing this index. The Sanborn Fire Insurance Maps Online Checklist provides a searchable database of the fire insurance maps published by the Sanborn Map Company housed in the collections of the Geography and Map Division. The online checklist is based upon the Library's 1981 publication Fire Insurance Maps in the Library of Congress and will be continually updated to reflect new acquisitions. The online checklist also contains links to existing digital images from our collection and will be updated as new images are added. If you have any questions, comments, or are interested in obtaining reproductions from the collection, please Ask A Librarian. To date, over 6000 sheets are online in the following states: AK, AL, AZ, CA, CT, DC, GA, IL, IN, KY, LA, MA, MD, ME, MI, MO, MS, NC, NE, NH, NJ, NV, OH, PA, TX, VA, VT, WY and Canada, Mexico, Cuba sugar warehouses, and U.S. whiskey warehouses. We recently were given many historical documents related to Washington, PA and the Washington Fuel and Oil Company. These include deeds, mortgages, insurance documents and others. Some of the surnames on these documents are Bolton, McCollister,Gilmore, Baker, Meyers, Ecker, Bedillion, Hatfield and Price. Contact the society if interested. Holdings include many of the records from 1886 through 1942, the 56 years of continuous operation by the last company to own the mine. They cover personnel records, operations, maps of the underground workings, plans for on-site facilities, letters to and from the Kennedy Mine, legal actions, ore quality and quantity, financial balance sheets, and purchases of supplies, land and other mines. Also photos of the operations from the 1870s to the present and fire insurance maps of the facility at various times during its operation. Personnel records include Payroll ledgers, applications, accident reports, California insurance, as well as other miscellaneous documents. There are bound volumes of copies of the letters from the Kennedy Mine Superintendent to the Mine Board as well as all other letters he sent. Of particular interest are the Superintendent's view of accidents at the Mine and the Mine's legal liability in them. They provide a narrative of progress from a marginal financial gamble, through wildly successful times, then decades of eking out a marginal living, and finally government-mandated shutdown. There are a few records of operation of the mine prior to 1886, and perhaps extending back to the 1860s. The Kennedy Mine Archive also has documents and pictures relating to the mine after it was no longer in operation, from 1942 to the present. This includes about 10 years of ownership by its last Superintendents, 33 years by Sybil Arata, and 10 years by the Kennedy Mine Foundation. I think you can begin to see the variety of places that insurance documents may be found. “African American Genealogy Part IX: Wills, Deeds, and Insurance Policies.” Accessed June 25, 2015. http://www.geni.com/blog/african-american-genealogy-part-ix-wills-deeds-and-insurance-policies-370305.html. Catlin, Peter. “UMW LibGuides. Genealogy. Websites and Databases.” Accessed June 25, 2015. http://libguides.umw.edu/content.php?pid=265180&sid=2189692. “History of Insurance.” Wikipedia, the Free Encyclopedia, December 23, 2014. https://en.wikipedia.org/w/index.php?title=History_of_insurance&oldid=639321563. “Slavery & Insurance Examining Slave Insurance in a World 150 Years Removed.” Accessed June 25, 2015. http://www.insurancejournal.com/magazines/mag-legalbeat/2000/05/15/21120.htm.